Varidesk is one of the most popular standing desk brands in the world. The reason is that they were one of the first with a reasonably attractive product at an affordable price. This allowed Varidesk to get a great lead on other companies. For those folks who have purchased a Varidesk or are considering the purchase of a Varidesk I suggest you take a minute to consider the accessories you will want with your Varidesk. You can stop with just the desk, but you will find it much more enjoyable with some additional items. What good is your sit-stand desk if when you’re sitting or standing your posture is a mess? Really? The reason you want to stand is likely that you want to be more comfortable, more healthy, and have a longer career at your desk. I have completed the training cycle with one of the first posture trainers in the world and it works in seated, standing, and walking positions. Now that I’ve completed training I highly recommend this product to others, whenever they consider standing or walking at their desk. It gets everything lined up so you get the most out of your desk. Giving your feet the proper cushion while standing is really important. If you do not have great all-day shoes or if you are at home and are not wearing shoes while you are at your desk, a standing mat is extremely important. The difference is important. The level of support is very different between the two. And, I guess there is the third kind: The standing mat that wasn’t designed for either. Purchasing a standing mat from Walmart, Costco, Sams Club, or another major retailer at a low price, you are probably getting something designed as a “Kitchen Mat” meant for no shoes. Getting a well designed product from a company like iMovR or Varidesk generally indicates you are getting an all-day with shoes “Standing Desk Mat“. One other note, watch out for the latest mat-fad which is to make mats in to shapes other than flat rectangles. Though they seem like a good idea they ruin your standing posture and create more trouble for you than they are worth when you’re using a standing desk all day. Take the time to understand what you are buying. Here are some options from NotSitting. Your first adjustable monitor arm will change your life. I remember the first time I had an arm that didn’t move… I loved the desk space. Then I received my first moving monitor arm and I discovered that I could collaborate with my peers much better, I could adjust the focal depth of my monitors when I forgot my glasses or was standing closer to my desk, and I could adjust my monitors up and down when I sat or stood and my posture changed. I highly recommend adjustable monitor arms because they allow you to get your hands and head in the correct ergonomic position for standing. Most people think they want multiple-monitor arms when in fact, they would really enjoy a monitor/laptop arm. 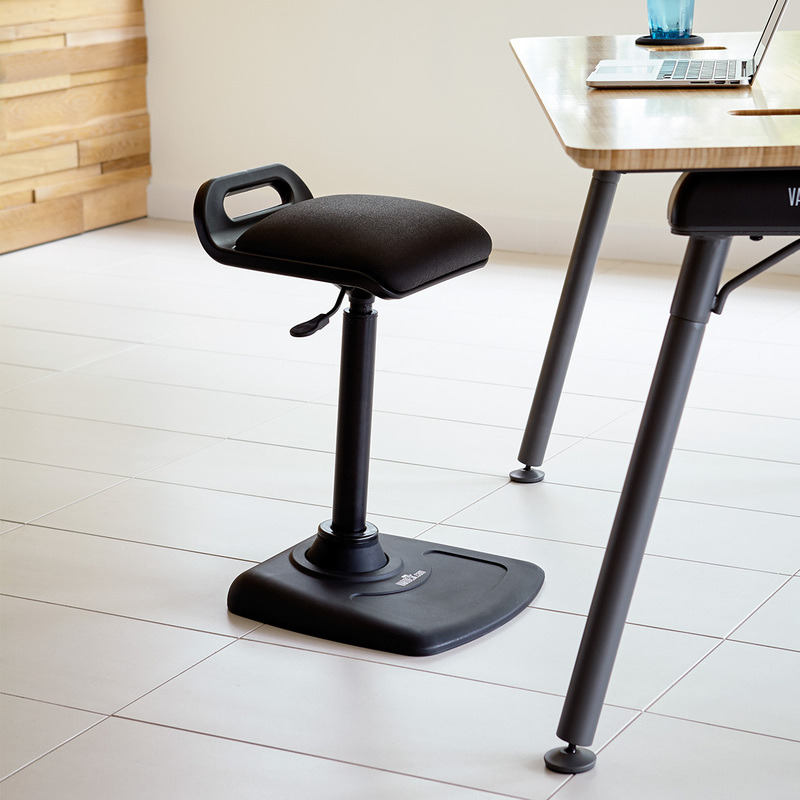 Once you start standing a lot you will find that unless you invest in an easily adjustable desk (like the Omega Olympus, Winston E series, WorkFit-D, or Luxor Electric) you will not want to move your desk up and down. This most typically happens to folks who have a hand-crank desk. How to fix the situation? With a standing height stool or chair of course. Before standing desks they were called drafting chairs or drafting stools (because architects figured out this standing thing way before the rest of us). You already have a chair if you have a Varidesk but you might find that you would rather have something that comes up to your desk, rather than something you have to lower your desk to get to.